Hi. My name is Rita and I'm addicted to keeping way too many scraps of paper. Is that you, too? I tried cleaning mine out a bit this past week when card making wasn't working and I realized that I need to use those things up! I'm going to try to do a card with only scraps (minus the card base) each Sunday for the next 500 years. I'm pretty sure I have enough scraps for that many years, but it might be close. ;) Now I won't be putting paper names because I have no idea what they are as they are just in bags by color. Great card Rita! Love the colors - great idea to tackle those scraps. I have three small (not that small) bins of scraps. That photo of Laila is adorable!! Wow, Rita! This is such a pretty, eye-catching card. I love the color combination, and the fun way to use scraps. Your 500 years comment made me chuckle -- I can SO relate. Love the fun colors in your card. I am a scrap hoarder as well........I even bought a rolling cart just for the scrap addiction....every so often I have to purge, just so the drawers will still shut! Beautiful card!! I love the lion and the fact that you used scraps. I too have so many scraps and always save them in case I "might" need them. Sorry that you are feeling blue. Hopefully you will feel better soon. What a cute picture of Leila. 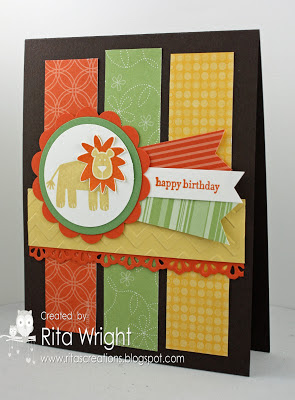 Rita, what a cute card and great use of scraps! I confess to being a scrap hoarder too! You just never know when that piece of scrap is going to be just the one you need! Love the pic of Laila in her pool! So glad you were able to get out and enjoy a date with your hubby! Outstanding card, and using scraps is a wonderful challenge. Some of my favorite cards were designed from my need to use up older DP. You are SO creative that I will be anxiously anticipating your Scrap Card Sunday posts. Boy do I know what you mean about piles of scraps! And good for you making cards using them! This is a very bright and fun card...love your little lion! And Laila is truly loving her pool and the bubbles.... So sorry you are having mood swings..hope they disappear soon and that your mojo reappears...but I don't see it failing - your creations are wonderful!